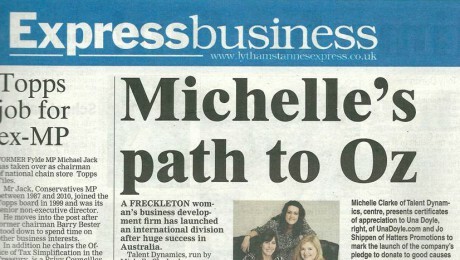 A Freckleton woman’s business development firm has launched an international division after huge success in Australia. Talent Dynamics, run by Michelle Clarke, has seen demand for its Pathway programme grow following a series of successful meetings on the continent. Michelle, 38, said: “The reaction we got in Australia was amazing. We decided the best strategy for our own growth was to engage local performance consultants who better understand the local market and are best placed to grow the business down under. They will be licensed to use the Talent Dynamics Pathway, the most popular tool in our suite of products.” The fulwood-based company’s first professional visit to Australia, which took Michelle to Melbourne, Sydney, Perth and Brisbane, saw her engage 12 staff.